Pierre Gagnaire restaurant comes with some novelties at its location on rue Balzac in Paris. First, the décor has been renewed, thanks to a collage of hand-written and antique books’ pages on the walls, embellished with animals and cryptic signs drawings. Besides, a table for two has been installed within the kitchen, allowing guests to admire the brigade working during the services. Moreover, a new lunch menu is offered at €85, with five little starters, one course and an assortment of desserts. 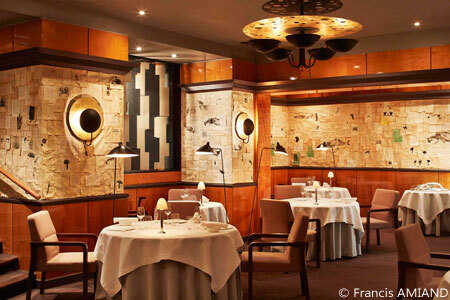 Pierre Gagnaire, 6, rue Balzac, 75008 Paris, 01 58 36 12 50. Thierry Marx, chef at Sur Mesure in the Mandarin Oriental, Paris, has launched a new lunch menu. Patrons can choose it according to the number of dishes, i.e. four for €60, five for €75, and so on up to eight dishes for €120. Among other selections are Marx’s classics like soya risotto and new courses such as calf sweetbread spaghetti and pumpkin moelleux, as well as organic wines by the glass from €10 to €18. Sur Mesure, Mandarin Oriental, Paris 251, rue Saint-Honoré, 75001 Paris, 01 70 98 78 88. After having been closed for years during weekends, Ledoyen, a hallmark restaurant near the Petit Palais, now caters to patrons on Saturday for dinner. It’s quite an occasion to treat oneself with the famous dishes from chef Christian Le Squer, such as the crusty langoustines with citrus fruit emulsion or skewered calf sweetbread with lemon grass and herb juice. Ledoyen, 1, ave. Dutuit, 75008 Paris, 01 53 05 10 00. Until May 2014, Jean-Yves Leuranguer, executive chef of Hôtel Fouquet's Barrière Paris, and his lieutenant Christophe Schmitt, will team each month with a famous chef or company for an exclusive dinner at the restaurant Diane. On January 21, they will prepare a special menu with Enrico Crippa, chef of Piazza Duomo in Alba; February 14, with Philippe Urraca, Meilleur Ouvrier de France for his skills in cooking chocolate; and March 14, with the Maison Milliat that supplies fruit-based items. For the two last dinners, the dates of which have not yet been communicated, it will be Emmanuel Renaut, chef of Flocons de Sel in Mégève, and Philippe Etchebest, former chef of Hostellerie de Plaisance in Saint-Emilion. Diane, Hôtel Fouquet's Barrière Paris 46, av. George V, 75008 Paris, 01 40 69 60 00. Each Wednesday from 7 p.m. to midnight, the “Shangri-Lounge” party takes place in the Shangri-La Hotel, Paris. This special event is animated by a DJ and benefits from a festive décor with disco balls and light projections on the walls and the ceiling. Champagne and creative cocktails from the barman Christophe Léger are served, as are dim sum and Torpedo shrimps. Shangri-La Hotel, Paris, 10, av. d'Iéna, 75116 Paris, 01 80 27 19 35. Under the supervision of Laurent André, executive chef at Le Royal Monceau, a new chef helms the stoves of the restaurant La Cuisine. The 30-year-old Hans Zahner can boast a solid résumé, due to his stints at Alain Ducasse Plaza Athénée, Restaurant Lasserre and Restaurant Le 39 V. His signature dishes include the pike dumpling from Lyon with lobster sauce and the sole from La Rochelle with semi-salted butter, tender potatoes and piperade. Lunch menu at €58 and dinner menu at €98. La Cuisine, Le Royal Monceau – Raffles Paris, 24, av. Hoche, Paris 75008, 01 42 99 88 00.